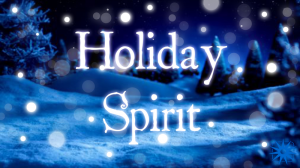 And I wish you a spirited holiday. No, not alcoholic spirits, or supernatural spirits. Spirit is important . . . an early life lesson for me. I grew up in a large family with the last name of Noel. Very Christmasy, isn’t it? We had little money and a dad who often worked the holidays meaning we had to wait…and wait…and wait to open gifts in a very cramped home. The spirit of what you do matters. How you treat others counts. What you give is significant. Your actions are more important than your intentions. Pretty good life lessons, aren’t they? Not just at the holidays but all year round. So, as we begin the long holiday weekend, I wish you . . . Thanks for sharing your article with me. Your mom must have been a very special woman!